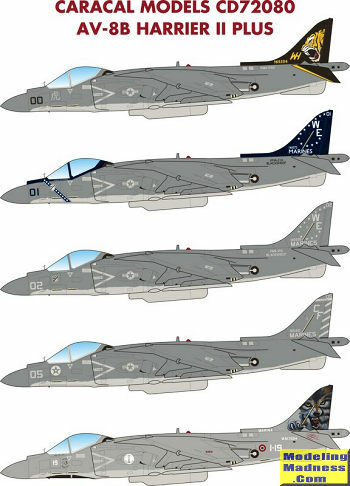 This particular Caracal Models sheet is for the Hasegawa 1/72 AV-8B plus kit. About this time, I'd say that these will work on other kits but I think that Hasegawa pretty well corners the market on this variant. Like your Harriers in grey? Well you are in luck as all of the USMC planes are 36118 over 35237, while the Italian option is 36231 over 36320. There are five options on the sheet. AV-8B+ BuNo. 165354, USMC VMA-542, 2016. Fin on this one is in Insignia Blue. AV-8B+ BuNo. 165572, USMC VMA-214, 2015. This aircraft's fin is Black. 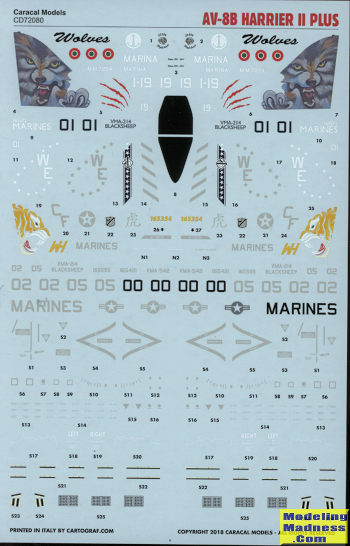 There are sufficient insignia and data markings for two aircraft and if you wish to use more markings, the kit decals can be gleaned for data markings. This set of markings is superbly printed by Cartograf so you know you are getting the best. Thanks to www.caracalmodels.com for the review sheet. Price includes US shipping. Get yours today from this link or have your local shop order it for you.